Every year Red Dot Tours presents awards for the top 25 places to stay in Sri Lanka, as voted by you. Based entirely on the customer feedback we receive, these awards are given at the start of every year to our outstanding accommodation. Our list spans a mix of boutique hotels, villas, retreats, resorts, and even tented camping, true to the diversity that characterizes travel in Sri Lanka. Behind the tasteful, yet anonymous entrance of 41 Lighthouse Street is one of Galle Fort’s largest houses and a true private sanctuary. Stepping into the villa, a proud entrance greets you still with the original black and white chequered tiles of the early 17C Portuguese owners. Once through the front section of the house, you enter the large, bright courtyard – a space for sunbathing, alfresco dining and refreshing swims in the exquisite pool. The sheltered gazebo in the corner of the high-walled courtyard is a meditative idyll. The whole of 41 Lighthouse Street has been finished to the highest standards with many personal touches giving the house a homely feel. 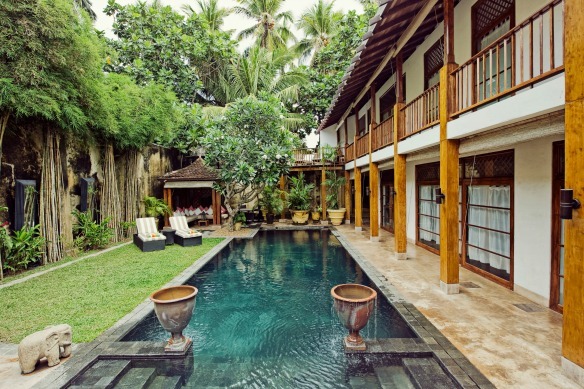 This is one of the leading private villas within Fort and can accommodate up to six guests. 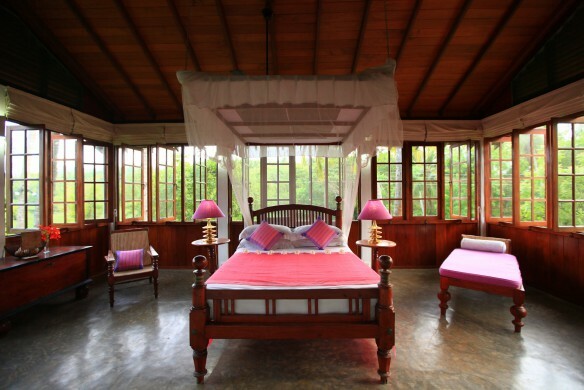 Rangala House is a converted tea estate bungalow with oodles of charm on the edge of the Knuckles mountain range. The house lies beyond Victoria Golf and Country Resort in the small village of Bobebilla, about 75 minutes from Kandy, 45 minutes from Victoria and 40 minutes from Pallakele cricket ground. The drive to the Knuckles Range forest conservation area takes 45 minutes. The tiny road to Rangala House is a challenge – typical of many interior rural roads – but resurfacing work was due to be completed by early 2013, making it more easily accessible for cars as well as four-wheel drives. Because of its isolated position, Red Dot recommends a minimum of two nights at Rangala House. For lovers of traditional Sri Lankan living at its best, they will not be regretted. For those without the time to head to the southern highlands, this part of Sri Lanka offers a convenient substitute on a journey between the cultural triangle and Kandy. 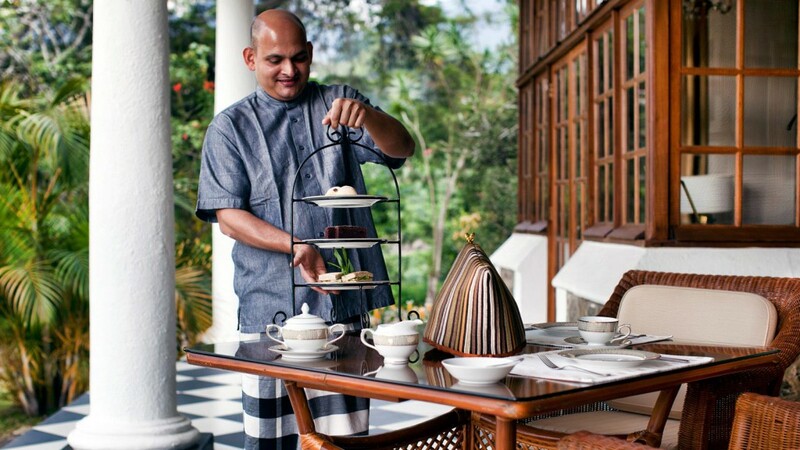 Tea Trails comprises of four classic colonial bungalows built for British tea estate managers in the days of the Raj. Each bungalow is different combining both classical and contemporary styles. The effect is quintessentially luxurious and colonial; a stroll back in time but entirely resplendent in modern amenities. 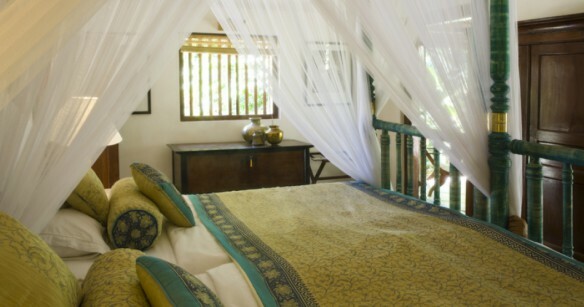 Within the confines of each bungalow guests will find over-sized rooms with four-poster beds, lavish bathrooms. A blazing log fire adds warmth when necessary to the Dining Rooms and Drawing Rooms. The gardens, meticulously maintained, provide the perfect place to relax amongst tropical plants whilst absorbing the breath-taking views. The gardens also feature sun-decks and summer houses where traditional English Cream Teas are served by the bungalows resident butler. 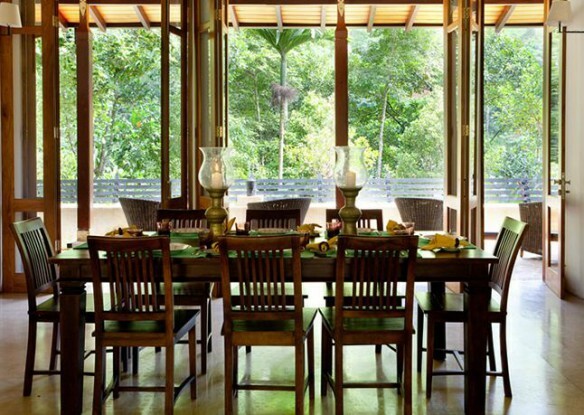 Lunuganga is the former country residence of the world-renowned Sri Lankan architect, the late Geoffrey Bawa. Lunuganga, not as much a staple boutique hotel as a living piece of history, offers guests a rare opportunity to step inside the private life of one of the world’s most celebrated architects, a man dubbed “the father of Asian architecture”. Once within the 25-acre estate, after a bumpy ride down winding lanes, it is not difficult to understand why in 1948 Bawa bought this former rubber estate to craft into his garden idyll. After decades of careful, exquisite, creative thought and design Bawa’s legacy and perhaps most personal life’s work is today a wondrous and inspiring place to visit and savour. With astonishing views and beautiful interiors, with many original Bawa artwork and blueprints on the walls, a stay in one of Lunuganga’s six fine suites is guaranteed to be a highlight of any holiday. Dining is at the edge of the tranquil Dedduwa Lake. 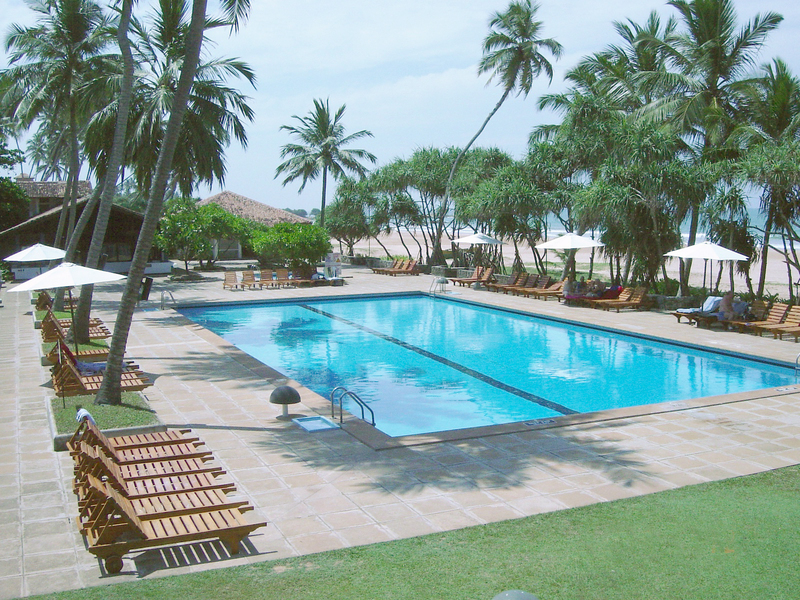 The golden beaches of Bentota are just three kilometers away. Victoria is a spacious villa designed by an Australian architect incorporating local architectural features of courtyards, verandahs and open-sided pavilions which let you relax and enjoy the tropical climate and spectacular sea views. Enter through the main door and on to a pathway edged by lily ponds. The well-appointed bedrooms are set on either side of the pond and an open-plan lounge area with uninterrupted views of the gardens and the sea beyond. Villa interiors are furnished with Dutch period antiques and built-in sofas that are ideal for lazing about. The clay-tiled roofs and terracotta flooring helps to keep the villa cool. Time is unscheduled here and life unfolds according to your wishes. A helpful team of staff, not forgetting Billy, the friendly pet dog, will make you feel very much at home. There are few villas on the beach that allow you to unwind quite so easily and completely as Victoria. It can comfortably accommodate up to 10 guests and is booked on a villa-only basis with the meals at cost price. Jim’s Farm, named after its British owner’s ancestors, offers a distinctive holiday experience: complete relaxation mixed with an experience of living on a farm. Accommodation is in 14 well appointed bedrooms set in three separate villas – Hill top villa, Spice Garden Villa and the newly added Mango Villa which was completed in 2014. Matale is well known for its rich fertile soil where aromatic spices such as cloves, cardamoms, cinnamon, nutmeg and pepper; fruits and vegetables grow in abundance. Jim’s Farm cultivates all this and more with much emphasis on organic farming and rainwater harvesting. Spring water from the mountains is put through a complex process of filtration and used on the estate. Take time to explore the farm; pick your own herbs and vegetables; and even learn to cook traditional Sri Lankan dishes. The Last House, so-called because it was Geoffrey Bawa’s architectural swansong, is positioned on an idyllic strip of land with a lagoon on one side and the turquoise seas on the other. The beach is fabulously long and offers safe swimming for much of the year. As one would expect from Sri Lanka’s most respected architect, a man that mixed Sri Lanka’s rich cultural past with a clean modernity, the villa is also very special. Essentially, the layout is shaped like a horse-shoe, with kitchen, living rooms and courtyard bedrooms surrounding the idyllic swimming pool on three sides. The advantage of this design is that while the various verandahs, dining and sitting rooms are well-suited to social occasions, the property also offers much privacy. We are often asked to make a distinction between Galle Fort Hotel and Amangalla. Both are ancient buildings, wonderfully restored. Amangalle perhaps insists more on exclusivity, whereas Galle Fort Hotel, while striving for the same high standards, has more of a welcoming feel in its lively verandah bar. Amangalla consists of an amalgamation of buildings dating back over 400 years, used as an HQ for the Dutch commander and his officers in the 17th century and later as a billet for British soldiers. In 1865, the New Oriental Hotel was born and in its heyday on either side of the Second World War there were no more sought-after or daring parties in Sri Lanka. But the hotel suffered for a lack of investment until the arrival of Aman Resorts, the leading luxury hotel development company in Asia. A long, sensitive and complete refurbishment followed and in 2005 Amangalla opened for business. Amangalla now offers excellent old-world luxury, superb food, arguably the best spa in the island and exceptional service. Horathapola is a perfect first stop for those of you seeking peaceful heritage accommodation after a long flight. One customer termed it `jet-lag heaven,’ praising `a beautiful house and faultless service.’ Situated on a working estate which grows coconut, mango, pineapple and spices, Horathopala is a four-bedroom British planter’s bungalow that was built in the 1920’s. The estate is now owned by Javana Fernando, who also owns Kulu Safaris. Javana lives on the estate and adds a friendly but efficient air to this wonderful holiday retreat. Spacious rooms furnished with ancestral Dutch period furniture, verandas opening out to the peaceful surroundings, well-clipped lawns scattered with beautiful hardwood trees and ample bird song all let you experience the Planter’s lifestyle at its finest. 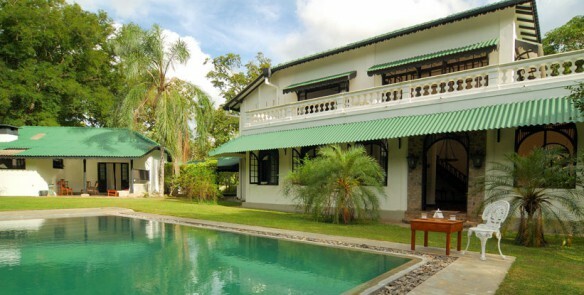 Serendip is a refurbished colonial bungalow set in peaceful and tranquil surroundings. Its vegetarian-meals only policy will delight many and may even give the doubters a chance for a different culinary experience. This old stone bungalow has been caringly revived by a Sri Lankan / Dutch couple, maintaining the old architectural features and infusing them with elements of contemporary design. Interiors are stylish with soothing neutral colours, blend of antiques and modern furniture, cooling cement floors, wooden pillars and verandahs. Relax in a planter’s chair on the verandah, soak in the Jacuzzi in the back garden, and at night dine under the stars surrounded by scented candles and oil lamps. Gardens scattered with fruit trees attract numerous species of birds. Serendip is rented per room, but provides much privacy. The Kandy House is a carefully-renovated old colonial ‘Walauwa’ (ancestral mansion) in the spice-growing hills that surround Kandy. Its completion heralded what the hill-country-capital has been waiting for so long: a brilliant small boutique hotel capable of offering stylish and private accommodation and attentive personal service in a beautiful natural setting. The inspired refurbishment of the ‘Walauwa’, with its light white interiors, polished hardwood floorboards, jackwood staircase, Dutch-style antique furniture and careful injections of colour, has been a triumph. 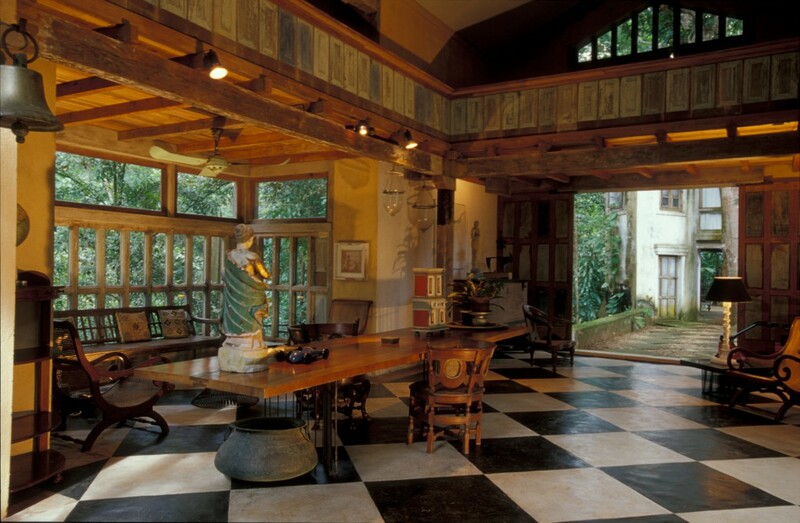 Channa Daswatta, one of Geoffrey Bawa’s protégés and Sri Lanka’s leading modern architects, provided the creative inspiration. 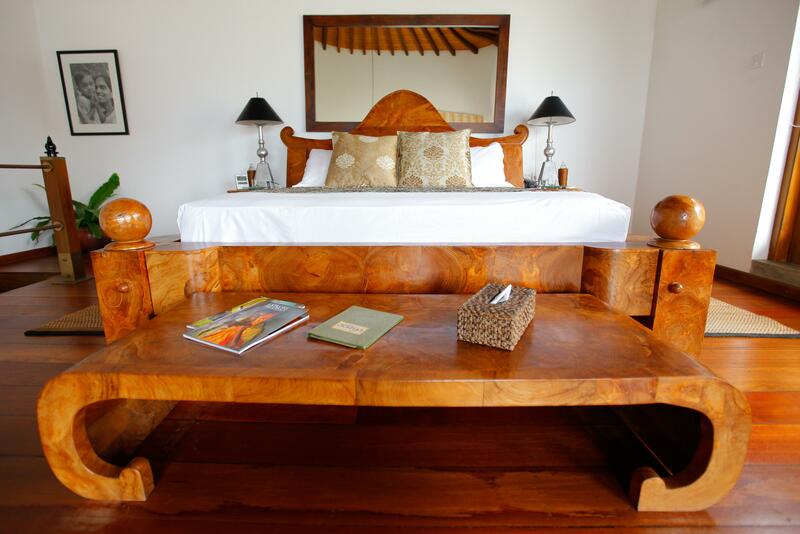 The bedrooms are unquestionably the finest in Kandy. The freshwater infinity pool in the garden provides an irresistible opportunity to unwind and relax under the shade of tropical trees. The wide verandas provide the perfect place to doze-away with your favourite novel. The Kandy House was once the seat of the king’s Chief Minister, Ratwatte Adigar, who betrayed his king to the British in the early 19C as Ceylon fell into colonial hands in 1815. Old Ratwatte family photos and antique furniture still remain. Note: Children are welcome, although they must be over 12 years. Opened in June 2011, this idyllic beach escape became the first to open in Batticaloa after the dawning of peace in Sri Lanka. It has a laid-back feel and is recommended for families or even for couples on a romantic honeymoon. ‘Maalu Maalu’ (meaning ‘fish fish’) is a cry regularly heard from the local fisherman when selling their day’s catch. `Maalu’ is also very much a part of the interior décor and the design of this wonderful beach resort which is bringing much-needed employment to a community hoping for a better future.The resort is designed along the lines of a ‘wadiya’ or fishing village with the public spaces and accommodation in the form of eco-friendly timber chalets with thatched roofs. 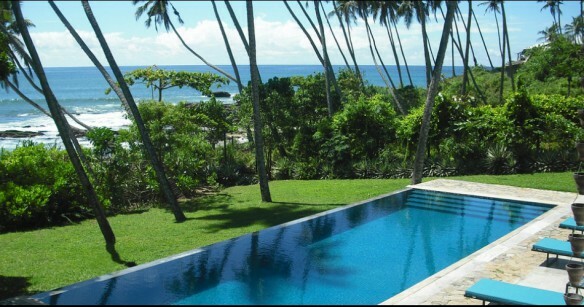 It is designed in a semi-circle facing the sea which allows for spectacular views of the Indian Ocean from every angle. An infinity pool is the central focus with a broad timber deck where hours can be sent taking in the sun. Maalu Maalu maintains a strict eco-friendly policy and is designed according to the green building guidelines on energy and environment. The resort welcomes families with children and offers chalets and suites with connecting doorways. Maalu Maalu Resort and Spa is for those wishing for an unhurried and relaxing beach holiday on a beautiful and secluded region of this tropical island. 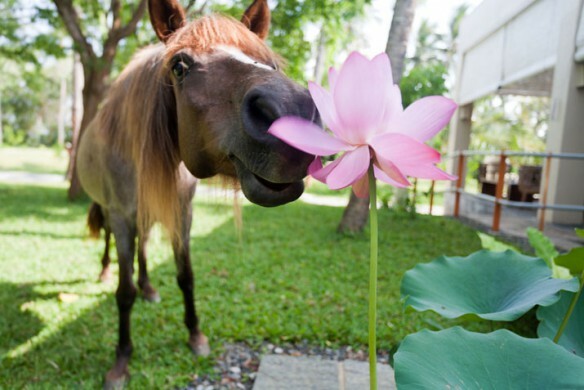 Coco Tangalla is managed by the owner of Kandy House and The Last House, both highly-regarded properties. The Main House and an adjoining annex lie at the highest point with the infinity swimming pool and gardens at lower levels. Interiors are stylishly decorated with a mixture of modern furniture and Dutch-period antiques, local art, and infusions of colour. 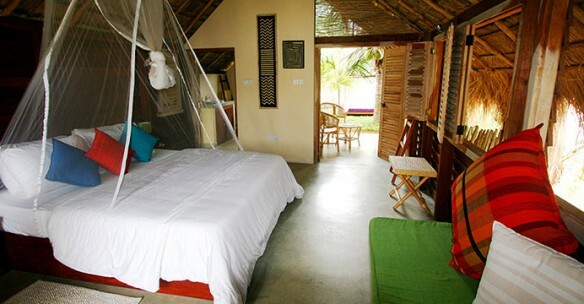 Coco Tangalla can be booked by the room or throughout and can accommodate up to 12 guests. Coco Tangalla welcomes children eight years and over. 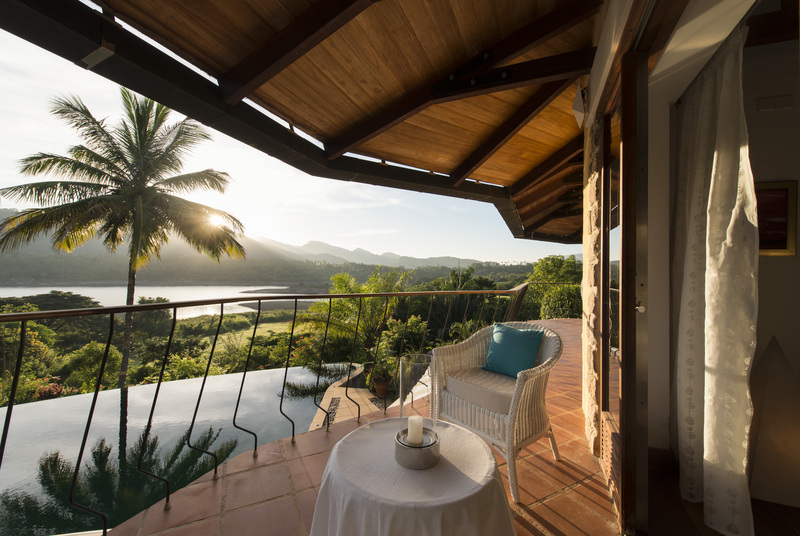 Bougainvillea Retreat is Danish owned and offers a relaxing holiday setting with breathtaking views across the Victoria reservoir and the Kandyan hills. Accommodation is in well appointed bedrooms set within the Main House and separate cottages immersed in lush green gardens. Wake up leisurely and sip a cup of tea on your own private verandah or balcony surrounded by bird call and even the occasional monkey that hovers on the tree tops. By day, relax by the pool side or immerse in mind and body wellness through yoga or a spa treatment. The more active might wish to play a round of golf, go bird watching, horseback riding or trekking within the Victoria estate. Bougainvillea Retreat can be booked by the room or as a whole and is ideal even for a special celebration. Children are welcome, but require close parental supervision as there are steep stairways. Buckingham Place opened its doors in September 2010 after being developed caringly over several years by its British owner along with Sri Lankan architect, Suchith Mohotti. This stylish 11-roomed hotel is contemporary in design with tasteful interiors. 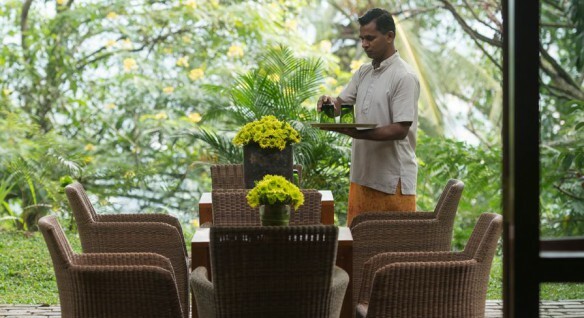 Sumptuous Sri Lankan and international fusion cuisine is prepared with fresh seafood purchased from the local fisherman and vegetables from the village home gardens. 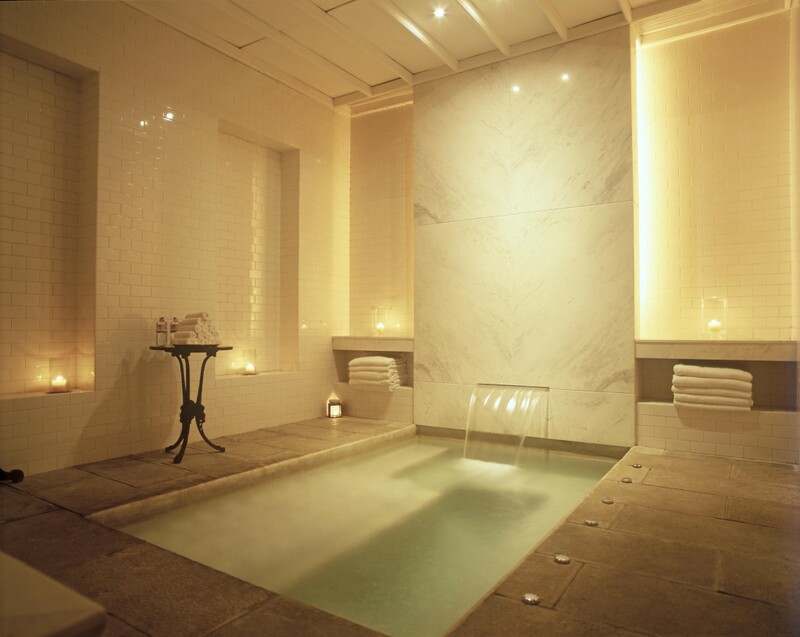 Buckingham Place is ideal for those wishing to relax and unwind amidst tranquil surroundings. Children seven years and above are welcome here and they will love the resident pony. Buckingham Place does much to benefit the Rekawa village and supports the valuable Turtle Conservation Project located nearby. Tintagel Colombo is the creation of Shanth Fernando, a Sri Lankan lifestyle designer and entrepreneur who also owns the Gallery Café – the capital’s leading restaurant — and the popular lifestyle home store Paradise Road. If it matches these ventures, its success is assured. The painstaking transformation of the house took just under three years as Shanth, assisted by architect Phillip Weeraratne, paid close attention to detail and refused to compromise on quality. The original colonial mansion remains with a few minor structural changes. An entirely new wing has been added at the rear which blends seamlessly, housing the exquisite bedroom suites, swimming pool and a small Spa. Elements of colonial architecture including high ceilings, ornate columns, arches and wooden floors have all been retained. Shades of white and ebony blended with vibrant red and black, permeate the interiors. Furnishings are exquisite: sofas from Portugal, hand-spun silk and woollen rugs from Nepal, modern art, silver gilded chandeliers and Egyptian cotton bedding. Tintagel will appeal to discerning travellers looking for stylish and luxurious accommodation in the centre of Colombo. We recommend it highly. A ‘wallawwa’ is typically an old manor house with architectural features of columns, courtyards and verandahs. The Wallawwa is just that and much more with an interesting history that dates back to the mid 17th century when it was owned by a head chieftain of Galle. This colonial bungalow has been lovingly restored maintaining its old world charm with a blend of luxurious comforts and stylish design. The bedrooms are situated around the central courtyard and pond. The restaurant serves sumptuous Asian fusion cuisine. Relax and unwind at the Z spa or laze by the swimming pool set amidst one of the finest private gardens in Sri Lanka. Several new luxurious suites, restaurant and bar were added in November 2012. Beaches are beaches anywhere in the world but it is often said that the interior of a country is where the true spirit lies. Sri Lanka is no different and Kahanda Kanda provides the perfect example. Set on a hill amidst a working tea estate which slopes down to the Koggala Lake at one end, this stylish villa was built in 2000 as a private villa and is now an award winning boutique hotel. Kahanda Kanda is the creation of its owner, a leading English interior designer, and the architect – an Australian whose credits include several highly acclaimed private houses. The backbone of this spectacular villa is an 80 metre saffron wall that runs along the length of the property providing much privacy and seclusion between the public areas and the suites. Accommodation is offered in terraced stand alone ensuite pavilions whilst the living and dining areas are also housed in their own pavilions. The interiors are a mix of Sri Lankan contemporary furniture and antique oriental accents. Kahanda Kanda is ideal for a quiet and peaceful holiday getaway. Children under 12 are discouraged here mainly to protect the hotel’s tranquil atmosphere. Palagama Beach is a small village in itself that spreads across acres of idyllic secluded private land with wild beaches, sand dunes, and coconut palms. The large swimming pool and dining area is set close to the beach. Guests have a choice of staying in one of three colourul wooden cabanas or in the more spacious individual houses. All are comfortably furnished and fitted with all modern conveniences. Relax by the poolside, spend a quiet morning in your own veranda with a good book, or venture off on an adventurous dolphin spotting excursions. Palagama Beach is ideal for families travelling with children. The Leopard Trails camp site is set bordering the Yala National Park and provides an experience of being one with nature without having to give up modern day comforts. The campsite is located in a remote area surrounded by water and wilderness. During the dry season the water recedes and more of the dry zone wilderness emerges along with numerous species of birds including plenty of peacock that struts about near the camp site. Leopard Trails offers old world hospitality and a personalised service. Sleep in spacious canvas tents with ensuite bathrooms; dine on Sri Lankan or western cuisine under a starlit sky; and explore Yala’s untouched wilderness in a safari jeepwith a picnic basket in hand. Up to about 12 guests can be accommodated at the camp site. At night fall, a silent generator is turned on to provide electricity to your tents to light up a few bulbs and the cooling pedestal fan – a welcome luxury in the wilderness. Originally owned by a Kandyan family, the Stone House was fully refurbished in 2014 by its new owners and is now a five-bedroom boutique villa offering luxurious accommodation, a secluded holiday setting and a personalised service. The house is designed with a stone façade that gives way to cozy living spaces within. The luxurious interiors are decorated with contemporary art, plush sofas and four-poster beds. The well appointed bedrooms and suites open out to private terraces where quiet moments can be spent reading a book and taking in the mountain views. The terraced gardens with the swimming pool at a level above are ideal for taking in the sun or dining under a moonlit sky. The Stone House can be booked by the room and is perfect for a romantic honeymoon or a family holiday. 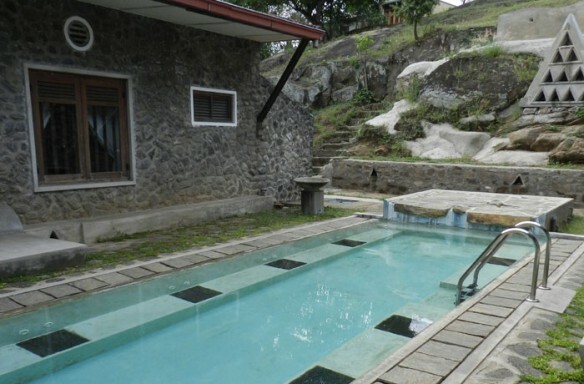 The Stone House is the sister property of Deer Park hotel in Polonnaruwa and Clove Villa in Kandy. The Kelburne Tea Estate has a history stretching back to the late 18C. Now cared for by the second generation of the Nadesan family, Kelburne continues to flourish and its three cute cottages attract travellers from far and wide. Red Dot has promoted Kelburne for many years with great success and the feedback is invariably good for those seeking simple but comfortable accommodation in a breathtaking location. If you rise early enough, you can be fortunate to watch pink skies as the sun rises at dawn, mountain peaks gradually looming through light mist and, as a dramatic landscape finally unfolds, a sense that you are at world’s end. Breakfast on the lawn in the crisp cool air as you take in the stirring landscape of the southern highlands; stroll through the tea plantation where tea pluckers are busy with their day’s work; take in the burnt orange skies at sunset and, after nightfall, savour a glass or two of wine by the fireplace. The individual cottages are undergoing a gradual transformation, each one being upgraded with additional facilities. Due to safety reasons, Kelburne is not recommended for children below 12 years. Sri Lanka’s ability to produce luxurious boutique hotels is now established, but Aditya arguably raises the bar still further. The Adityas is the common name for the 12 sun gods, said to dwell in the highest heavens, sustainers of the celestial light. It is an appropriate name for a quiet wonderful property designed both to de-stress and exhilarate. Aditya is designed with indoor gardens, waterways, and terraces that allows for spectacular sea views. Interiors are stylishly decorated with art and antiques from Sri Lankan, India and the far East. The gardens lead to the turquoise seas which are perfect for swimming during the season from December to April. 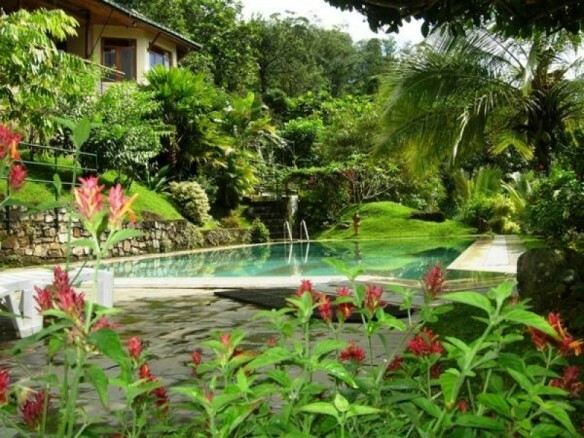 Aditya is a perfect setting for a relaxing holiday or even a romantic wedding or honeymoon. Club Villa is an enchanting spot, a beach property loved by a loyal clientele for its high standards of personal attention, immaculate service and excellent food. Set on a coconut grove, this 17-bedroom holiday retreat is not really a hotel, but a welcoming retreat where time unfolds as you wish. 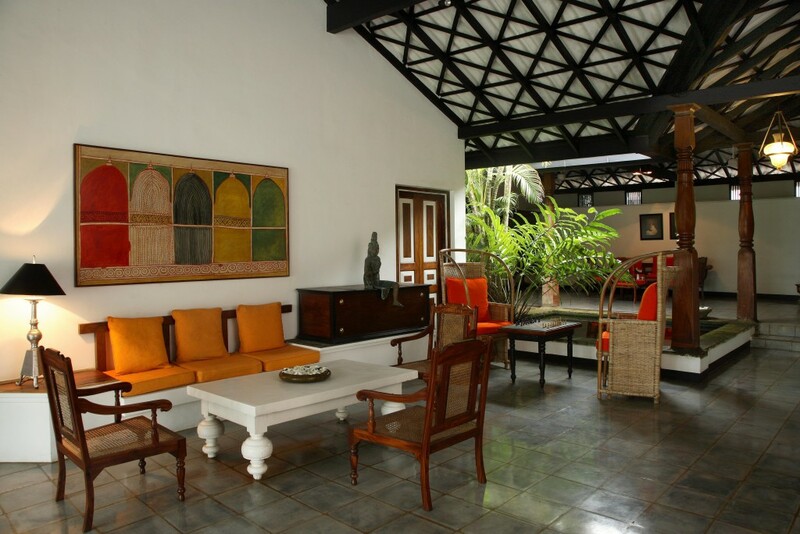 This well-run property has expanded over the years, retaining its original Bawa architectural features of courtyards and verandahs; ponds and waterways; cooling cement floors and clay-tiled roofs festooned with flowering trees and shrubs. Improvements have remained true to Bawa’s skillfully blended windows, doors and even a wooden staircase taken from an old 19C century southern villa with modern features. Interiors are decorated with black and white photography, local art, hand-woven murals and furniture which mixes modern and Dutch period antiques. Enjoy a calm and peaceful day by the poolside; take a stroll along the beach and taken in the beautiful sunsets; and by nightfall, indulge in a romantic candlelit dinner under the stars or retreat to a small restaurant. Tea and cake in late afternoon is another welcome touch. The turquoises sea that fronts the property is safe for swimming during the season from December to April. The beach is accessed by a few strides across the simple, single-track West coast railway line that runs at the edge of the garden. This dissuades a small minority from staying here perhaps, but the overwhelming feedback is that the occasional train is not intrusive, but rather adds occasional interest to an otherwise blissfully quiet day. Due to this railway line, young children should be well supervised. The Weir House, named after the weir that is located upstream, is the country home of a Sri Lankan family who has created a restful holiday retreat within a village setting. Surrounded by mountains and lush foliage, this is a blissfully peaceful spot, interrupted only by the sound of flowing water, crickets and birdsong. The house is on a six-acre estate scattered with fruit trees, vegetables, herbs, tea, coffee and flowering plants that attract plenty of birds. The house is perched on a hill and is reached via a series of steps and is designed with tall glass doors that open out to broad verandahs and the gardens beyond. Interiors are a mix of contemporary design with Sri Lankan and Indian touches. The Weir House can comfortably accommodate up to 10 guests and is rented to one party at a time ensuring privacy. It should be noted that Weir House is located on a hill and requires climbing several steps, making it difficult to access for those with mobility difficulties. It is also not suitable for children below 8 years due to the surrounding slopes down hill. would be more useful if the locations were given. no wonder reddot includes its own properties (no 41 lighthouse street and the walawwa) in their top 25. Very surprised ulagalla is not mentioned. 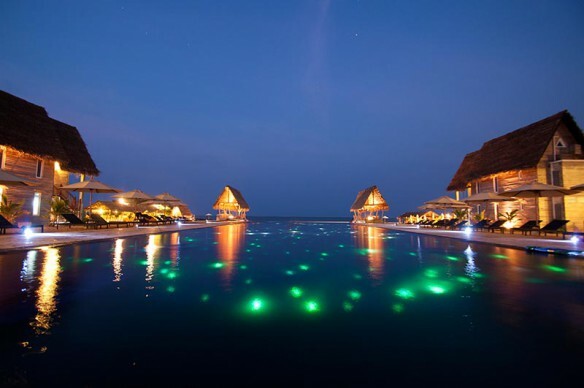 Wow, some amazing places to spend a relaxing holiday. Surprised to see none of the Uga Escapes properties in the list since they also offer an amazing experience. Great article, thanks for sharing! 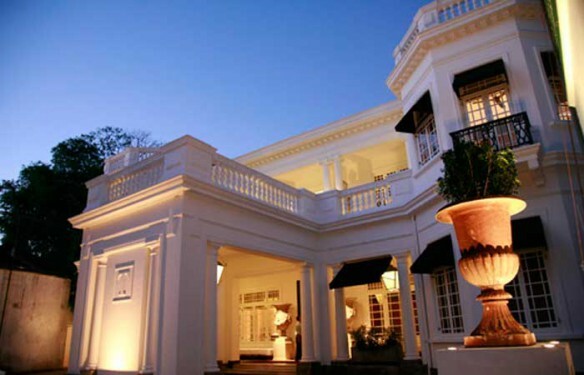 My wife and I also stayed at a villa called Allspice Villa outside Colombo in Kotte. It was a great experience and had some great decor! I will definitely checkout some of these places next time I am in Sri Lanka! Can I go an organised tour to these places when I visit Sri Lanka. Great to get feedback from guests, please do let us know if you have any other hotel recommendations. We definitely agree with you regarding the UGA properties. We’ve had some fantastic feedback about the Uga chain this year and we’re sure they’ll make it onto our next list! Agreed! A great property! Unfortunately it didn’t make the list this year, but we’ll take your feedback into consideration for next year’s hotlist! This list was compiled based on user feedback and we’ve already handed out the awards (!) but we’d be happy to take your feedback into consideration for the next newsletter! Certainly we can do this! We will attach locations later today. I wish you all the very success in all endeavors!!!! I am surprised that Bentota Beach and Warahena Walauwa are not listed. How about Palm Village UK? Surprised not the find Casa Colombo Mirissa and Uga Bay Passikuda on this list. I will travelling from Toronto to Colombo, I have a limited budget so these luxurious hotels are beyond my budget, I can afford guest houses situated along the sea shore, please post me more information as to your rates, etc.. Surprised that Mandalay Lake Villa on Lake Koggala is not listed. Was this done in 2013? LOOKING FORWARD TO STAYING AT A FEW OF THEASE LODGES THE NEXT TIME I REVISIT THIS ISLAND. Could you pls suggest a place for a day out ; where I can take 3 of my friends who r coming down to SL during this weekend? A marketing exercise for the properties they promote. It’s a very subjective top 25. Excellent info! One thing: most of them are rather expensive even for foreigners. Do carry on with the info! I agree with 50% of yr selections where places like Kelbern Haputale may not be up to the TOP level. 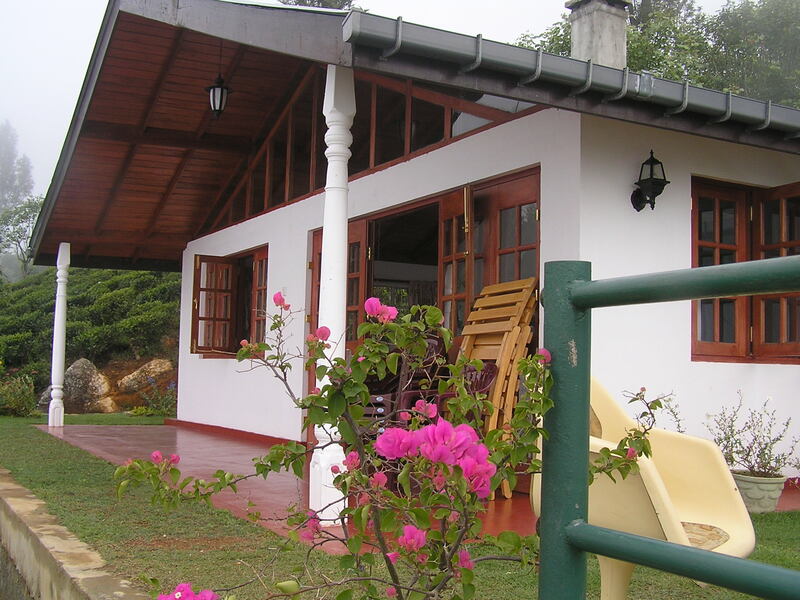 What about GlenDevon & Steford Bungalows in Ragalla , Nuwara Eliya. First of all, it was nice piece of information to refer. But like few others mentioned, there are few more areas to be included in this or to know what parameters being used to recognize these. Thank you for the review, very interesting to know other places in Sri Lanka. Hope you will also find our place interesting too. This sure is a good write up, with obviously the best Sri Lanka has to offer. Since there are alot of good hotels in Sri Lanka, compressing them to a 25 best list is hard, and there is a high probability that you have missed out a few really good ones. A personal recommendation would be Serendib Leisure hotels chain (https://www.serendibleisure.com/) since I loved their service. They are top notch and I really think they deserve a spot here.